Reigning Turkish Airlines Euroleague champion Olympiacos Piraeus picked up its second consecutive Top 16 victory by beating Fenerbahce Ulker Istanbul 82-71 at the Peace and Friendship Stadium on Thursday night. 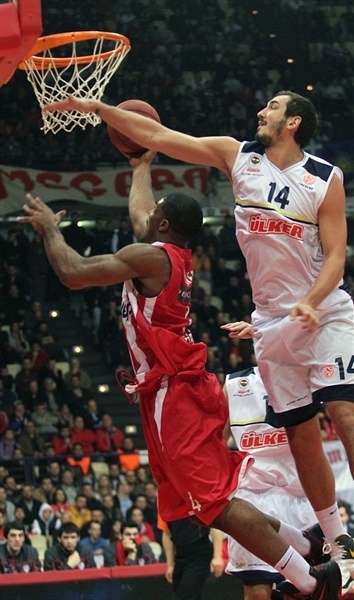 The win improved Olympiacos’s record to 3-3 for fourth place in Group F, while Fenerbahce dropped to 1-5. The Reds took control of the game with a 8-0 spurt in the second quarter, and then cruised to victory after pulling away to a 20-point advantage at the beginning of the third quarter. 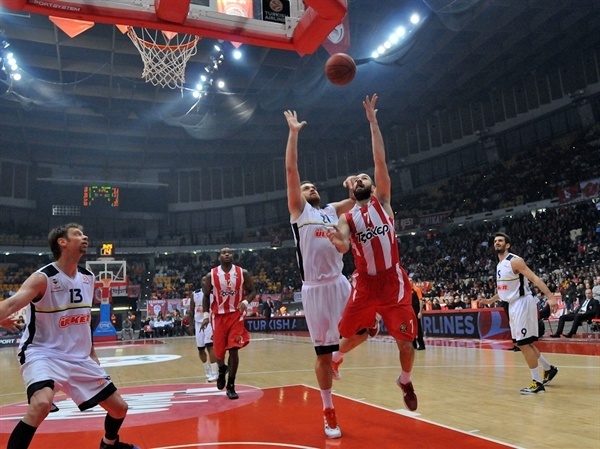 Georgios Printezis scored 11 of his 13 points in the first half, and Vassilis Spanoulis also finished with 13 for the winners. Acie Law had 12 points in less than 13 minutes before being ejected from the game after an altercation with Romain Sato. Kyle Hines scored 10 points before leaving the game to receive stitches for a cut above his eye. Bojan Bogdanovic, David Andersen and Bo McCalleb combined to score 58 of Fenerbahce’s points. 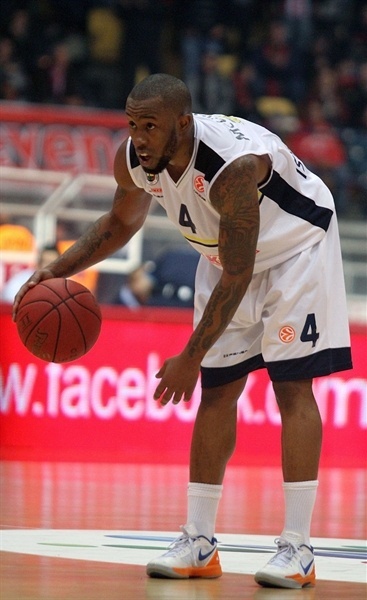 Bogdanovic and Andersen each finished with 20 points, and McCalebb scored 18 in defeat. Andersen started the game with a three-pointer, and Olympiacos opened its account with baskets inside from Giorgi Shermadini and Kostas Papanikolaou. With the offenses having their way early, the visitors countered with a drive from Bogdanovic and a triple from McCalebb, while Reds kept going inside to Printezis and Shermadini, 8-8. Fenerbahce opened a 5-point lead as Andersen and Bogdanovic each scored twice more from close range, and McCalebb hit another triple, but Law made couple of steals for fastbreak layups, then added a basket-plus foul, before Printezis made it 19-19 from the paint. Olympiacos went in front on a fastbreak layup from Spanoulis, but Andersen answered from long range and McCalebb made an acrobatic driving layup that gave Fenerbahce a 23-24 edge after 10 minutes. Printezis reached double figures with a triple at the start of the second quarter, before Ilkan Karaman and Stratos Perperoglou traded put-backs. Uros Tripkovic sank a triple to make it 28-29 before the hosts went in front with an 8-0 spurt that included a dunk from Kyle Hines and layup-plus-foul from Law. Andersen snapped the run with a fadeaway jumper, and after Kaya Peker and Hines traded layups, 40-33, both teams were dealt a major blow as Law and Romain Sato were ejected for their on-court altercation. The two players got tangled under the rim while fighting for a position underneath the hosts’ basket, and after some forceful pushing and shoving, both players were issued disqualifying fouls. After emotions calmed down, McCalleb and Bogdanovic got Fenerbahce within 3 points, before Spanoulis nailed a triple to give Olympiacos a 43-37 halftime lead. Kostas Sloukas extended the lead to 9 points with a basket-plus-foul, before Andersen made a turnaround jumper at the other end. After Printezis and McCalebb traded mid-range baskets, Papanikolaou hit a three-pointer and Shermadini’s hook-shot opened a 53-41 lead. 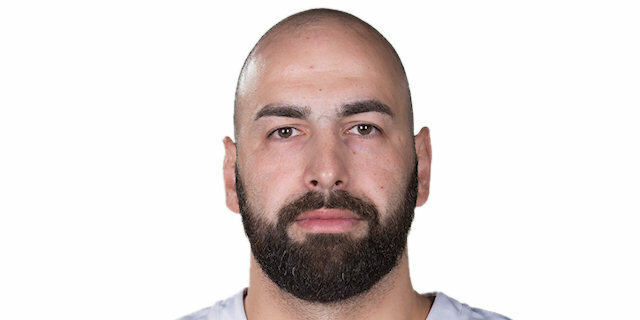 Sloukas extended the advantage to 16 points with 4 free throws, and after Andersen scored a layup, Spanoulis hit a triple and Hines added a put-back helping to extend the lead to 20. Bogdanovic snapped a 15-2 run with a three-pointer from the left corner, but baskets inside from Hines and Pero Antic made it 68-49 after three quarters. Spanoulis hit a jumper and Shermadini made a layup to extend the margin to 23 points at the start of the fourth quarter before Bogdanovic hit a triple and McCalebb made a layup. The tempo significantly slowed down and the visitors did not allow a field goal for more than four minutes, but only managed to cut the deficit to 75-60 when McCalleb scored another driving layup. Spanoulis ended the drought for Olympiacos, and Perperoglou nailed a triple to get the lead back to 18 points, but Fenerbahce answered with a 0-8 run as Baris Ermis made couple of layups and Andersen hit another jump shot. 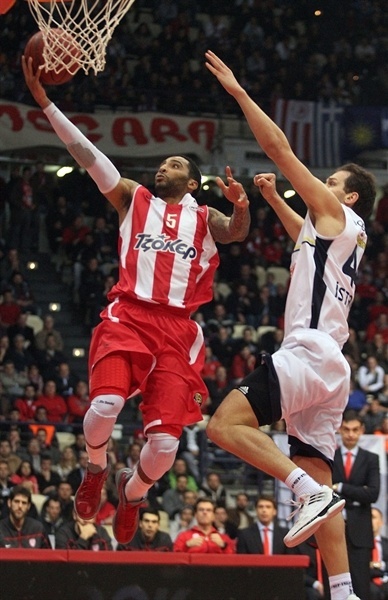 However the margin was too great to overcome and Olympiacos celebrated its third Top 16 victory. "We corrected the mistake from the game versus Siena and this is our second win in a row, after the one we got in Tel Aviv. It was a very difficult game, because we were forced to play without our starting point guard, Vangelis Mantzaris and we lost very early Acie Law, who was playing great. I was obliged to use some unusual schemes, but the whole team played with determination. We dominated under the boards and dished a good number of assists, but we missed 11 free throws and some open shots. It is quite risky to say that we are again in good shape, because the season is long and we have to play without Mantzaris." "It was a tough and difficult game. We came here without Onan and Preldzic , but I think that the game was over when Romain Sato was disqualified. We didn’t have the rotation needed in the perimeter and some players were forced to play more minutes that they usually do. We tried to remain competitive, but it was difficult to do so without Sato. He is a key player in several parts of the game, but despite the problems my players didn’t surrender. I hope that we will find our confidence and this is a reason to feel proud. Olympiacos showed respect to our team, as they kept Spanoulis until the end and they called a timeout in the last minute. The ups and downs are normal, because we are a new team. We lacked confidence after the loss to Montepaschi Siena, in a game we were leading by 11 points. 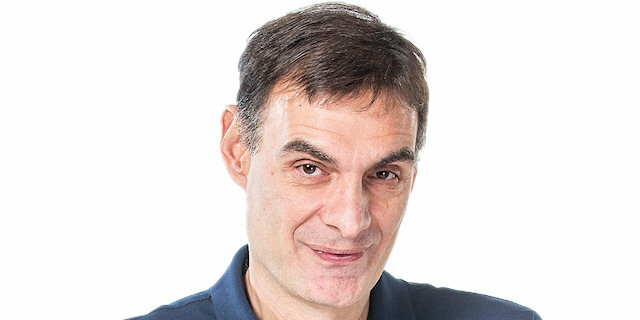 In the Euroleague you have to be concentrated and not lose consecutive games. We are still seeking a big win, but I don’t know when and where we will get it. I don’t feel pressure because we are 1-5 do far. I am a coach who pressures myself." "It was not an easy game. It looks like it was, but it wasn’t. After the loss to PAOK in the Greek League game, we had to work and try hard in order to beat Fenerbahce Ulker. Individually they are very good, but since we got our rhythm and played much better in defense, we did it. 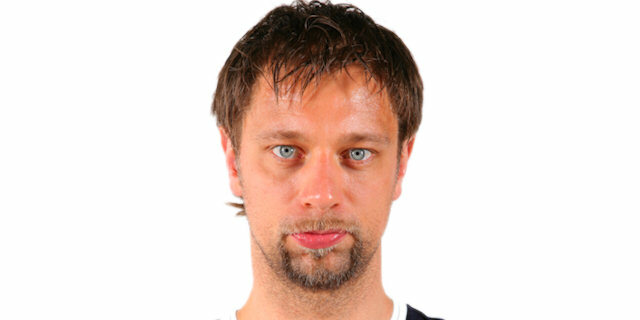 I hope that after two consecutive victories, the situation will be better, but we have to prove it game by game." "We had injury problems and our job here was a hard one. We also missed Romain Sato during the game and the situation became extremely difficult, especially in defense. Now we are 1-5 and a great comeback is needed. It is not an easy task, but we will do our best."